We both managed to sleep so weren’t in too bad a state when we got up at 8. We had breakfast and then walked to the Old Port and caught the 10.30a.m. ferry to Lokrum Island. Although the island is very wooded, there are some open parts and it was really hot walking so we found shade as soon as we could and parked ourselves on a couple of loungers for about five hours. It’s customary to pay if you sit on items provided which we duly did when the man turned up. A few people moved along as they didn’t want to pay. 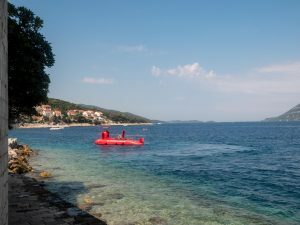 We looked at the view of the Adriatic and watch people swimming, kayaking, sunbathing or doing things on boats. We all oread and snoozed – lovely! Lunch was a toasted cheese sandwich and water. 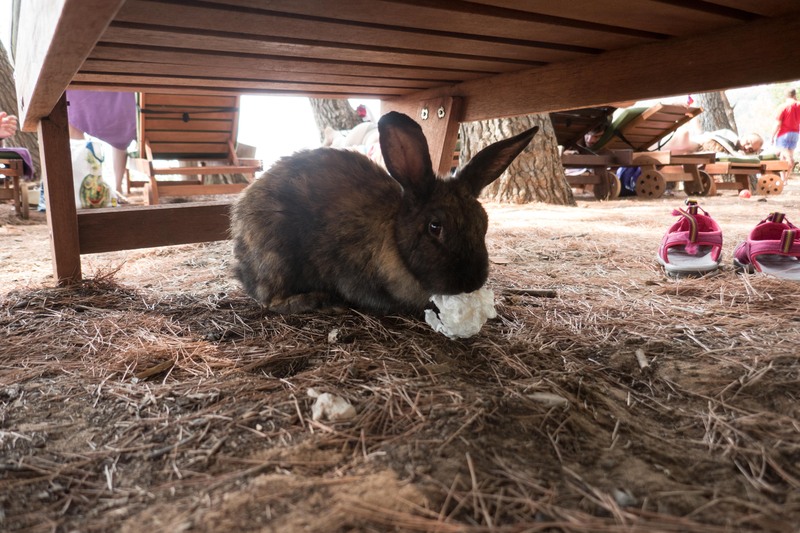 The big surprise of the day was to see rabbits hopping around, completely unfazed by people and even taking food on a couple of occasions. They were mostly the lop eared type and varied in colour from black to ginger. We probably saw about a dozen in total. On our way back to the boat we stopped at the monastery complex and gardens. The island has been home to various bigwigs over time who built a mansion and laid out formal gardens. 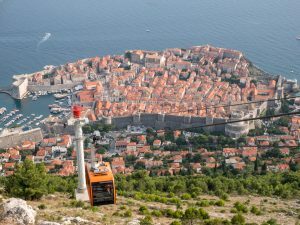 We got back to Dubrovnik in the late afternoon. It was a bit cloudy and very slightly cooler than when we’d left. We bough bus tickets for our ride tomorrow morning, bought a final postcard from a very unfriendly woman, changed some large notes for smaller notes and bought ice creams. The bank visit was frustrating as the cashier told us she would only change 100 kunas and shouldn’t do it at all for reasons she couldn’t explain. It was the same bank we had done the same thing at last week so that was all a bit of a mystery. After a short rest at the apartment, we went back out for dinner. We had a return visit to Mea Culpa where Bev had a nice but enormous portion of mushroom risotto and CJ had a nuclear hot veggie lasagna and an Aperol Spritz. Towards the end of the meal we got chatting to a couple of Irish women at the next table. They were very friendly and nice and we exchanged our experiences of Croatia, Bristol, Belfast and Dublin. We bade a final farewell to the swifts flying noisily along Stradun and headed back to get ready for our flight home tomorrow. We would both like to come back to Croatia as it’s beautiful but would come at a less busy and hot time of year. The alarm went off at 7 and we were at breakfast for 8 and out of the B&B at 8.30a.m. The queue for the ferry was already enormous. We did get on but the only seats were on the rear deck by the very noisy engines. It was fairly cool but we had to use headphones or hastily devised earplugs to protect us from the noise. The ferry fell behind schedule as there were so many people getting on and off at each stop so we docked 20 minutes late into Dubrovnik. It’s even hot here than it was last time, but we braved a walk to the main bus station in Gruz to check out where the airport bus goes from. Bev has read that the bus is often full when it gets to the old town, which will be a problem, if true, so we are thinking of starting from the bus station to be sure of getting on. We decided to get a cab to the old town and then trundled and carried our cases to the apartment. Jelena was home and let us in. She was very helpful about buses and suggested we could get a bus to the bus station on Wednesday. We ddi the minimum of unpacking and then went in search of lunch. We ate at Stara Losa, the upstairs restaurant is Michelin starred and very posh but we ate out on the street. We had yet more gazpacho – delicious! – and a shared Greek salad plus drinks. As befits a Michelin starred establishment, it was expensive but very good. Back to the flat for laundry, unpacking and resting. There was a mini thunderstorm whilst we were there but unfortunately it did nothing to ease the humidity, so although it was a bit cloudy when we went to the cable car, it was no less sticky. The cable car gives a lovely view over the city and the Elaphiti Islands but is an expensive outing. We were just as excited by seeing a flock of sheep with a lamb! They were roaming freely when a half-hearted man and 2 very ineffectual barking dogs turned up to attempt to move them about 20 metres on. We returned to the city and found the bus stop we need to be at to get to the bus station and did a bit of shopping before gong out for dinner. We ate at Dalmatino tonight and it was cocktails all round – Kir Royal for Bev and Pina Colada for CJ. Bev had a salmon fillet with wok fried veg and CJ had hand rolled macaroni with truffles and mushrooms. Both were good. An Aussie couple at the next table struck up conversation and the man talked about their extensive travel experiences and what he’s done for a living. He is currently a hairdresser and decided to give Bev hair advice! He was a great talker so it was lucky there had to go and pack or we could have been there all night. Just for a change, we awoke to a hot, blue sky, sun filled day. CJ wasn’t sure he had actually slept; Bev had managed once the upstairs neighbours had shut up. After breakfast we managed to catch the 10.30 bus to Stari Grad. Good job we turned up a bit early as it was packed to the gunnels and the final passengers had to stand. It was a pretty route with views of the Adriatic and pretty little villages called Milna and Dubokovic. The journey took about 20 minutes and the bus terminated at the town’s bus station which was a relief as it made it easy to know where to get the bus back from. Stari Grad is a small, very sweet town, much more low key than Hvar. There ere far more older people per square metre than in Hvar and it felt relaxed and unhurried. Much more us, as CJ said. We did our usual wander, starting at the tourist office for a map where a more friendly person agreed that Croatian is hard but said she finds French and the Nordic languages very difficult. English is now taught from primary school age which goes some way to explaining the excellent standard we have found everywhere. Our first stop was a place called ‘Tvrdalj‘ which used to be home to a Croatian poet called Petar Hektorovic. 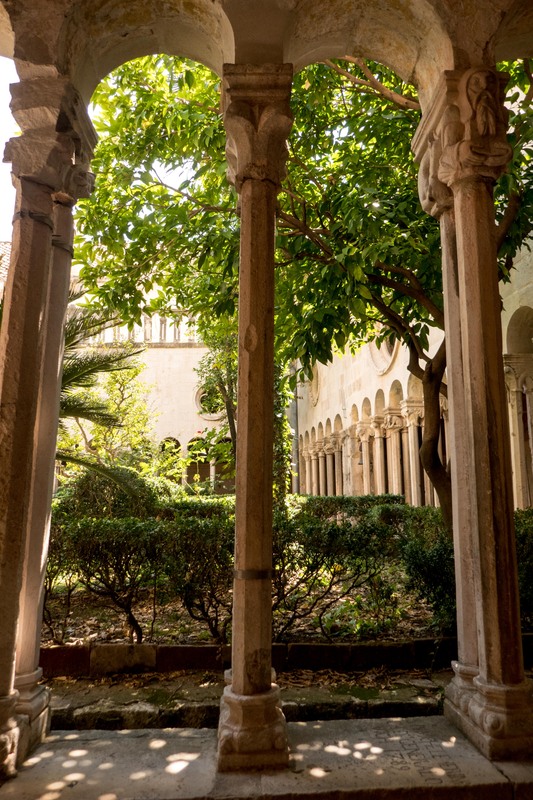 You can only visit a cloistered area and a bit of what was his garden. The cloister has a pond with mullet in it and the garden was nicely shaded. The whole place was very peaceful. We walked through town, taking a look at the boats and on to a residential area next to the sea. CJ spotted that there was a greater likelihood of seeing more portly and less than perfect figures bathing here – again, much more like us! We heard English, French and German but also more Croatian which was nice. Having finished our wander, we stopped for lunch at a place called Odisej where a very nice young waiter looked after us. We both had a bowl of yummy gazpacho and a feta, avocado and other veg salad. Bev would have liked more avocado and CJ found the feta very salty, but it was a tasty and generous bowl. We rounded off with tea and coffee and spent a further half hour touring another part of the town. It is very, very old in places and there were references on a couple of buildings to Pharos and Greece. We caught the 2.30 bus back to Hvar, stopped off for an ice cream and came back to our room for our now routine rest. Rest over, we went to try to find a taxi boat to try to get to one of the Pakleni Islands that lie just off shore from Hvar. We caught a boat to Jerolim, about five minutes away and sat on a rocky shoreline in light shade and a lovely breeze, looking back towards Hvar. We even dipped a toe in the sea and found the water to be warm. While we exposed our toes, others were baring all as part or all of Jerolim is a naturist beach. We caught the 6p.m. taxi back. The captain managed to avoid colliding with a catamaran that was just about to dock! The ferry honked at him and he decided to turn the power up to avoid a collision. Safely back on land we made our way to our room and shortly afterwards made our way out for dinner, We managed to nab a table at Black Pepper, a very nice place on a side street between the fortress and the seafront. It was expensive but we had a nice meal and CJ had a lovely fruity cocktail. There were also aperitifs and dessert wine offerings. Back to the B&B as it’s an early start tomorrow. Inconsiderate fellow guests are one downside to being on holiday. Ours decided it was fine to come in during the night and talk at normal volume as they headed to their room. Stone flours and wooden flooring mean that noise carries well, unfortunately. Hey ho. We breakfasted at 9 – a choice of cereal, fruit, yogurt, croissants and bread, plus juice and tea/coffee. It’s another hot and sunny day so we did our usual application of sunscreen and insect repellent before we set off. Bev has been bitten a few times. We made our way slowly and gently uphill to the fortress that sits above Hvar, a 16th century fortification built by the Venetians. Apparently, there has been some fortification on the site since the Byzantine era. The views en route and at the top were worth the hot climb and we were rewarded with a slight breeze too. Having had a look round, we made our way back down, stopping for an ice lolly whilst being deafened by cicadas. The grounds were full of agave bushes and cacti, all looking as though they’d welcome some rain. On our way to the fortress we’d ask a couple of water boat taxis about getting to Stari Grad. We were told you go by road so we went to look at the possibility of a road trip. There’s a bus that goes several times a day which is the most economical way but CJ likes the idea of hiring a buggy! We asked at the nearby tourist office about bus fares and an unhelpful and unfriendly young man just about managed to tell us. We haven’t been impressed by the tourist office staff in Hvar. CJ spotted a place selling sandwiches so we bought a cheese and salad baguette each and iced tea and came back to our room to eat and cool down. Our next task was to try to find some shade where we could sit and relax. We managed to borrow a couple of beach towels from the B&B and ended up in a sort of park area opposite the sea. Beaches and parks are not what we are used to in the UK. People lie out on rocky outcrops or on slabs of concrete and the parks have no grass, presumably because of the heat. We found a shady place and settled down to read/rest. We lasted a couple of hours which was pretty good given that the ground was rock hard. Making our way back to the hotel, we stopped for an iced latte and another spot of people watching. Back in our room we rested for a bit and then went in search of dinner via a quick visit to the cathedral which had decided to ope its doors. We ended up in a small, popular restaurant in a fairly quiet part of town where we both had pizza. Bev’s was OK; CJ’s was nice. We came back to the B&B via the main square which was still packed with people. As we had a relatively early departure today, our plan was to have breakfast at a little creperie just up the street from the apartment. Unfortunately, when we got there just after 8 we were told that the person who makes the crepes hadn’t turned up so only drinks were available. We bought more croissants from the supermarket and had breakfast at the apartment instead. We left a bit before 10 and dumped our bags at the luggage store before having a final trip around Korcula. It was very hot with little breeze so we soon stopped for a drink and a sit down. We went to a bit of the town we hadn’t visited before and sat in some welcome shade watching the sea, boats and swimmers. We had an early lunch consisting of scrambled egg on toast for Bev and what was meant to be a cheese omelette for CJ, but which had ham in too! Having collected our cases, we we joined the queue to board the 1p.m. ferry to Hvar. We arrived in Hvar on schedule and set off to find our new accommodation. We went a slightly circuitous route but found it before too long which was just as well as it was very hot and climbing stairs with suitcases in 30 degrees is not much fun. We are staying at the Devecchi Rooms, a 3 roomed B&B just about a minute away from the where the ferry docked on what we hope will be a quiet street. Our room is very comfortable with a bit of a view on to the Adriatic. 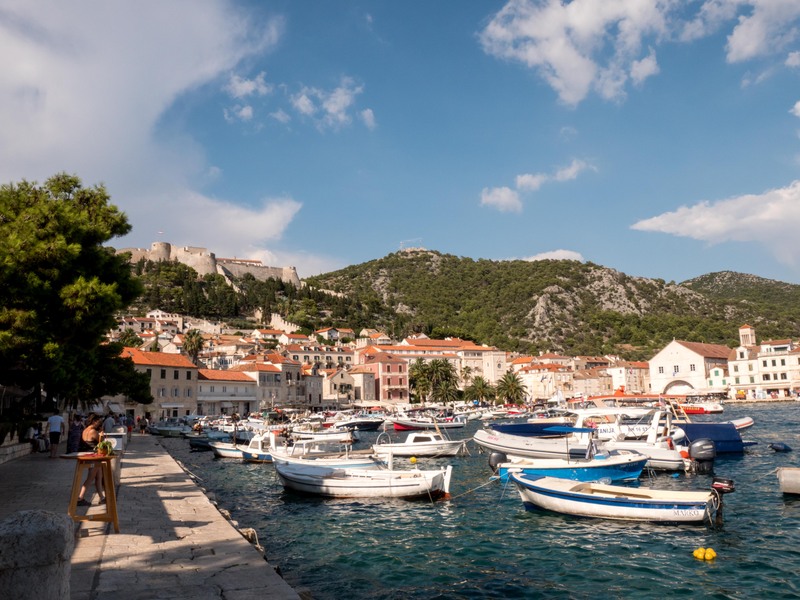 Once we’d settled in and recovered from the heat (helped by very good air con in the room) we headed out for a taste of Hvar. 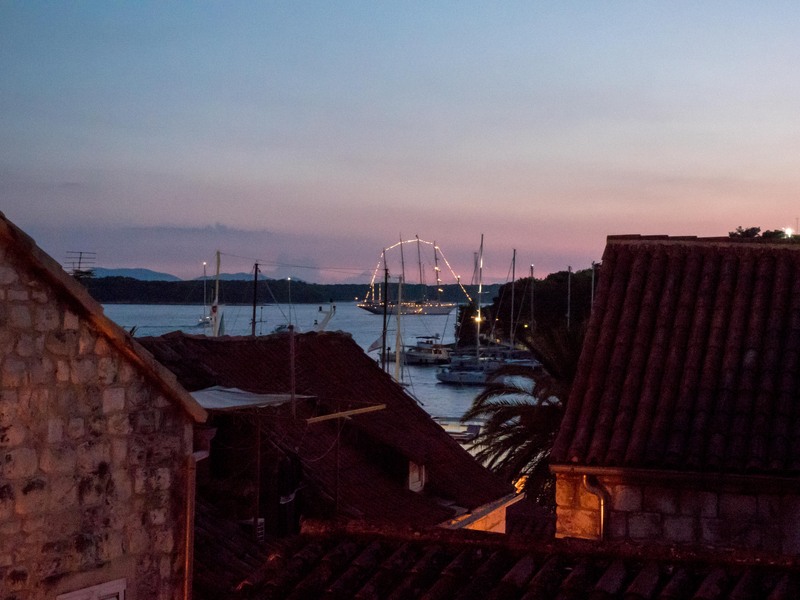 Hvar is pronounced Huar – no v sound and with a roll of the r if you can manage it. It is a big town, very pretty and old and, once again, has lots of steps. It has become famous for its nightlife and attracts many young people. CJ reckons there’s no-one over 20 years old – we are the exceptions! We found the central square and made ourselves comfortable with an iced latte each and a slice of apple strudel for CJ before visiting the very poorly equipped and rather unfriendly tourist office. We are on the lookout for a boat trip but the only ones we’ve found so far are whole days to fairly distant places which involve swimming so we’ll keep looking. Having had a pleasant walk along the harbour and seafront to get our bearings a bit, we returned to our room for a rest and CJ looked for places for dinner. We ended up at Konoba Fig and had a tasty meal of veggie curry and roasted veg and hummus. Everywhere we have been, people have spoken excellent English, and the trend continued at Fig, helped slightly by having an Australian waitress on the staff. The konoba didn’t do dessert but recommended that we try Nonica, a patisserie nearby. The Australian waitress gave us written directions as it was a complicated route. The directions were a success and we had coffee plus a tiramsu for CJ and a cookie for Bev before going back to the B&B. CJ wants it to be recorded that we haven’t seen a single seagull yet. Joy of joys, we both slept really well. We had a cup of tea in bed to celebrate and then it was up for our breakfast of muesli, juice and croissants. Once we were ready we headed to town and booked ourselves a trip on a semi sub. We saw quite a few fish of various types and sizes, bits of the old town walls, urchins, lots of grass like plants and various bits of detritus like beer cans. The water was pretty clear and four electric fans and the door to the deck being open kept us from being too hot. The trip lasted 45 minutes and the captain expertly steered through some narrow and shallow channels. CJ had spotted a restaurant serving gazpacho on on our first trip into town, during which Bev had tried and failed to buy 5 stamps in Croatian(! ), so we headed there for lunch. We had a bowl of gazpacho each and shared a plate of gnocchi with truffles. CJ managed an Aperol Spritz too. We had another look at the market in case a floaty dress lay in wait for Bev to buy – it didn’t- and then went back to the apartment. We discovered there had been a power cut. We’d seen a man up a power cable on our way back so assumed he was trying to restore power. Luckily he was successful. We contemplated visiting one of the nearby islands by water taxi but the return times didn’t suit our evening plans so we sat at our little table and read. CJ retired for a lie down and got up later to have a glass of wine with snacks whilst watching the boats. It’s been very hot and sunny today but luckily the breeze has returned and our table is in the shade from the afternoon so it’s very comfortable sitting out. We have a relatively early start tomorrow as we have to be out by 10 so we need to leave time to pack tonight. We had another nice meal at Apertina consisting of rocket and walnut pesto bruschetta, we shared homemade pasta with basil pesto and a tomato and feta cheese salad and peaches with ginger cooked in white wine for dessert. We saw another wonderful sunset too. Apertina is such a popular restaurant; people were queuing down the street to wait for a table. We then went to see the Moreska being performed. It’s a traditional sword dance made into a performance by including other dancing, accapella singers (one of whom was the waitress from where we’d had lunch) and then the main event. The story seemed to be the King’s daughter/wife being taken by another King and a fight ensues over her. The dance consists of seven short sequences during which carefully choreographed fights take place followed by a bit of walking around before the next fight starts. The fights become increasingly intense and fast as they reach the finale. It has a musical accompaniment too. The good King wins and regains his woman. CJ said it reminded him of Morris dancing! The Moreska apparently dates back over 400 years and is still going strong which is good news. Packing and bed before our next Croatian town tomorrow. The owner turned up this morning. He retimed the fan so that it won’t come on at night and we took the opportunity to ask for some hooks. He was very helpful and returned with hooks and a few more hangers a bit later on. Once he’d been we had breakfast, including freshly bought and cooked croissants from the nearby supermarket. The apartment is well situated with shops, cafes and restaurants less than 2 minutes away. We explored more of Korcula and Bev managed to find a Blanc du Nil shop where she bought a very pretty blouse. We had a Greek salad for lunch near the sea and continued our wandering after lunch. During this wander, Bev managed to find yet another clothes shop, this one run by an Italian woman, and a lovely grey linen dress which she also bought. It is almost birthday time after all! CJ went up the bell tower of the cathedral, St Marco, but Bev decided the ascent looked dodgy and stayed on the ground. It was a wise choice as CJ had to cross an iron grating at the top of the climb with a good view right to the ground! A couple of Tintoretto paintings are located in the cathedral so we went in for a look before having an ice cream and cappuccinos at a cafe. Back at the apartment we sat at the little table outside which overlooks the marina and watched the coming and going of the boats. Some attempted mooring, with greater or lesser success! A small glass of wine and a few nibbles kept us going until it was time to go for dinner. Apertina was our restaurant tonight. It doesn’t feature in search engines but is well worth seeking out. We had zucchini and celery soup, aubergine rolls filled with feta and tomato sauce and a rosata (very similar to creme caramel) each for dessert. CJ had wine cocktail made from Grk (a local wine) with something sparkling. It was an acquired taste but he persevered! We enjoyed our meal so much that we have booked to go there again tomorrow. Another plus of Apertina is that it’s right by the sea at a point where you get a fabulous view of the setting sun and we were treated to a fabulous sunset – a glorious globe glowing its way into the sea. We took a look at the small market on our ay home and managed not to buy anything. We are really hoping to sleep well tonight. Today we visited the cathedral, the Jesuit church (located in the oldest part of the city where some buildings survived the 1667 earthquake), the Franciscan monastery and the attached pharmacy; reputedly the oldest pharmacy in Europe. The monastery has retained the damage from a missile shot fired during the war, on 6 December 1991 to be precise. We had hoped to visit the Dominican monastery but it was closed for restoration. We had omelettes and salad for lunch at a quiet restaurant and then headed back to the apartment to collect our cases as we are off to Korcula today. We said thank you and goodbye to our landlady and caught a taxi to Gruz where the main port is located. The journey to the port was free flowing, mainly because we went before the cruise ship passengers returned to their boats, so we arrived in good time, left our bags at a luggage store and had a walk around the port area and sat in a park where some incredibly loud cicadas serenaded us. We and hundreds of others boarded the ferry at 3.30 and it left punctually at 4p.m. 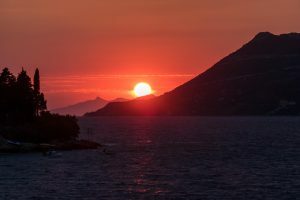 It was a very smooth journey and we docked on time at Korcula and waited for Ivan, our new host, to come to meet us. We had booked to stay in Castello Rezidence Korcula 2, a property right by the sea. The apartment is a brand new renovation, was very clean and well equipped (other than hooks for towels!). The bedroom has no window which seems to contribute to it being damp and there is a dehumidifier which we were told needed to be on all the time. Having settled ourselves in and got a few supplies for breakfast, we ventured out into Korcula Town. It is small and lovely, sited on the headland with the azur Adriatic all around. It’s much calmer than Dubrovnik and also noticeably cooler, with a very welcome breeze. We liked it instantly. Dinner was huge bowls of pasta – truffles, mushrooms and olives with tagliatelle for CJ and veg and Gorgonzola with long thin macaroni type pasta for Bev. The ‘macaroni’ is a Korcula speciality and is apparently hand made. More people appeared as the evening drew on and it was busy but calm as we went on a post dinner stroll, taking in the lovely sights of this small but perfectly formed town. We had an interesting night! We turned the dehumidifier off as it was too noisy to sleep through and settled down. Some sleep occurred but the next thing we knew, a fan high up in the wall of the bedroom kicked in. There was no obvious way of turning it off and it was certainly going to make sleeping impossible. CJ texted Ivan but he had no suggestions about how to turn it off so we read for a while and tried to get to a very sleepy state. Courtesy of excellent earplugs, we finally managed to drift off and woke up to find the fan was off! A thunderstorm and torrential rain overnight did nothing to cool the temperature so we were glad to be on the city walls before the cruise ship passengers and the hottest part of the day arrived. 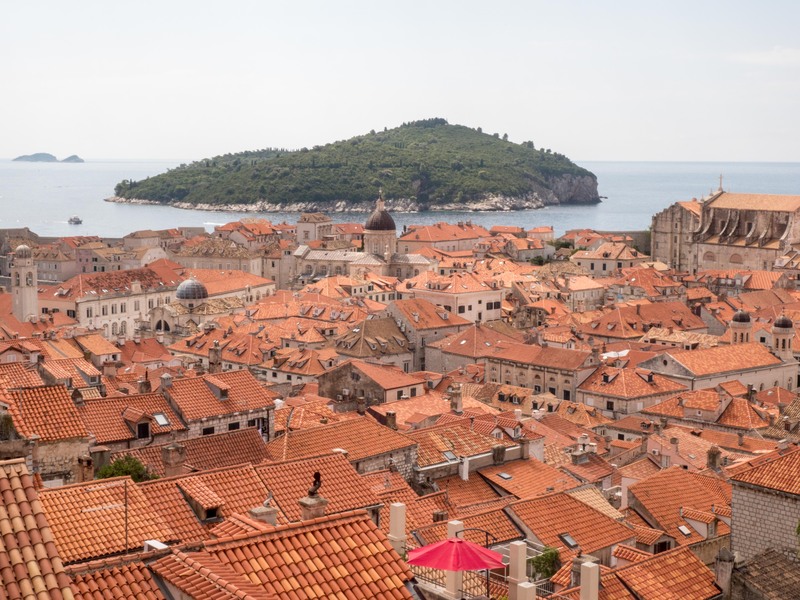 Everyone says the walk around the city walls is the first thing you should do in Dubrovnik, but early in the morning soon after you arrive is also good. It is a very special thing to do though as Dubrovnik is such an attractive city and the red tiled terracotta roofs on the creamy stone coloured buildings are seen at their best from above. We were very hot by the time we finished our meanderings and cooled down with a couple of smoothies at a cafe in a square near Pile Gate before heading back to the apartment for a rest. Our timing was excellent as more rain and thunder started just after we got back. Once the storm had cleared we ventured out again and had lunch at one of the many restaurants on Stradun – a bruschetta and a salmon sandwich. Both were very nice but would have been improved if we could have escaped the chain smoking German woman who sat next to us! The storm had affected the temperature though and we felt almost cold in the strong breeze that it had brought in. The cafes and restaurants had either taken down their ubiquitous parasols or were hanging on to them every time the wind blew. We wondered how they accommodate everyone when it rains as there were too many people eating and drinking outside to fit inside! We visited a bank to try to get some smaller Kuna notes and joined a long queue of people who were exchanging their Euros for kunas. Be warned – Euros are not accepted anywhere other than airports. We were told it’s illegal to use Euros in Croatia. 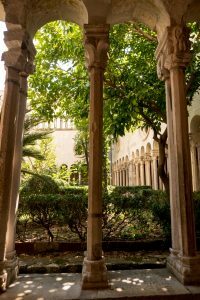 We visited the Rector’s Palace and after a rest at the apartment (these were frequent to escape the intense heat at the hottest part of the day), we went out to see some of the many streets we hadn’t yet visited. 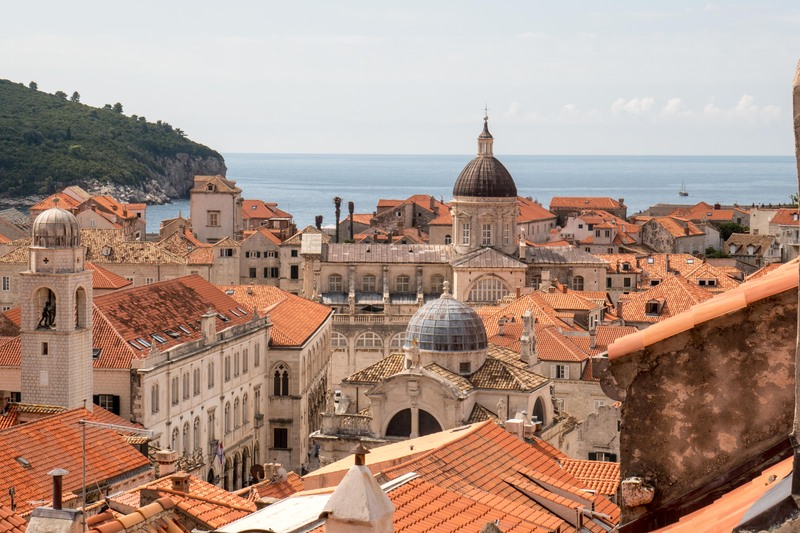 Dubrovnik is a warren so it’s easy to find new places to stroll. We even managed to find some where there were very few people. We had a very tasty dinner at Nishta which is described as a vegetarian restaurant but seems to be vegan. It’s very small so booking is advisable. We chose rice crepes with curried lentil filling and roasted sweet potato with creamy chard and roasted veg plus a chocolate and berry cheesecake. 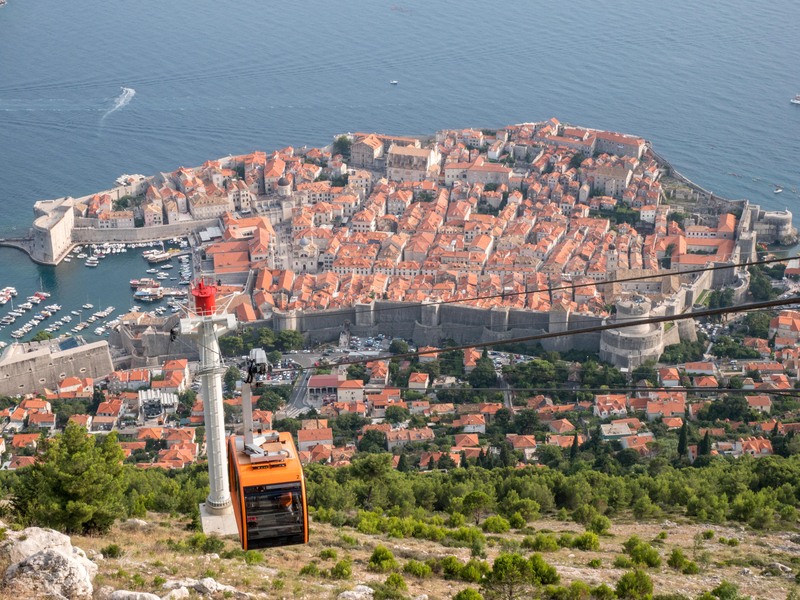 Arriving at Dubrovnik airport, we caught the Atlas shuttle bus to the Old Town of Dubrovnik. The temperature was in the high 20s and it was very sunny. We alighted at Pile Gate and lugged our suitcases to Apartment Brilliant situated on Ulica Naljeskoviceva where we met the owner and her baby. She gave us loads of useful information e.g. 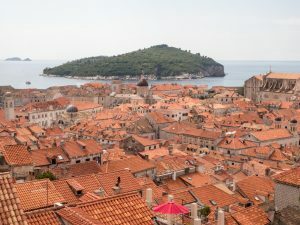 about places to eat and told us some facts about Dubrovnik such as some locals wanting to move out of the Old Town because of the lack of space and the effects of tourism. The apartment is in her family home where she has lived all her life. Her father wanted to move after the 1990s war but she decided to stay and has renovated the house and created the ground floor apartment. The apartment was very clean and comfortable. It has air con – much needed! 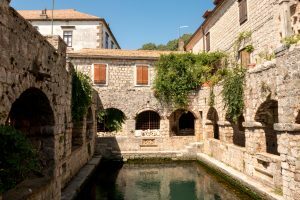 We made our first foray into the Old Town centre and discovered it was packed full of people, which would turn out to be a feature of much of the rest of our time in Croatia. We had a nice pasta dinner at what seems to be a popular and well regarded restaurant called Mea Culpa. After dinner we wandered though some streets of the Old Town, along with many others.